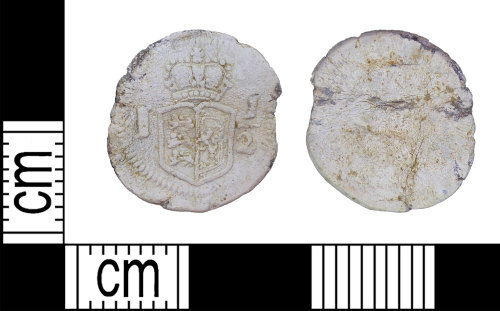 Post Medieval lead alloy token, 1707 - 1800? Thickness: 1 mm, diameter: 15 mm, weight: 1.23 g.
The token is circular in form and rectangular in cross section. It is decorated on one face with the combined coats of arms of England and Scotland in a shield with a crown above. This is flanked by a I and a 1/2. The combined coat of arms suggest a post Act of Union, 1707 date. A shilling of Anne (1702-14), post union with Scotland in 1707, 4th bust type and dated 1711 on the reverse. Reference: Spink 3618.